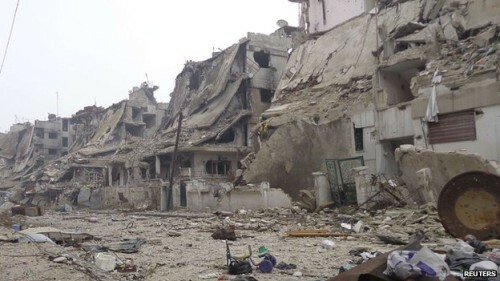 After occupying parts of Homs for more than two years, insurgents have finally agreed to leave Syria’s third-largest city. An agreement with regime forces was finally reached on Friday after weeks of attempts by the Syrian military to clear out the insurgent-held areas, including the Old City, by force. A 48-hour ceasefire will be followed by an insurgent evacuation north of Homs as Syrian forces move into the Old City and other areas. The final negotiations for the agreement included the two sides and United Nations and Iranian officials. State news agency SANA reports that insurgent mortar attacks killed 16 civilians on Saturday. SANA said strikes on the al-Aziziyeh neighborhood in Aleppo left 12 dead. The damage at the Faculty of Economics of Aleppo University, where two people were killed and several were wounded, some critically. Meanwhile, Syrian air forces dropped barrel bombs on the Jandoul and Baedeen roundabouts and killed four people in the Karam Al Afandi area. Four people were killed by a mortar shell which hit a microbus in the al-Dweil’a section of Damascus. In her reporting, she has brought together an entire anthology of false and hypocritical terms that we find in Western rhetoric. She wrote her report with the approval of Western capitals. She said Syrian authorities had not met UN requests for permission to pass through border crossings to reach 1.4 million people immediately, and she demanded a “step change in delivery”. Whatever the Americans do not say, Amos says. What the French do not dare to say, she expresses. Whatever embarrasses the British, she adopts. Whatever the Israelis consider secondary, she emphasizes. She has become a tool of the campaign (against Syria)…. Amos is no longer worthy of her mission, and the U.N. must urgently extinguish the fire lit up by her lies. She undermines the UN’s work and credibility. NOW reports, from residents, that Syrian warplanes have been attacking the Lebanese border village of Tfeil. “For the past two nights, Syrian warplanes have been throwing barrel bombs on the Ain al-Jawzeh farm in Tfeil, where over 2000 Syrian refugees have sought shelter,” a resident named Mohamad said. “As a result two Lebanese civilians, a female and a male, Mohamad Ali Haidar and Fatima Ahmad Hamoud, were killed in the process. Tfeil, with almost 4,000 Lebanese inhabitants and 10,000 Syrian refugees, has been besieged for more than four months by Hezbollah and Syrian forces. Lebanese security forces finally reacted to appeals by opening the road to the village almost two weeks ago, providing aid and arranging safe passage for the wounded. Lebanese forces did not enter the village. They came for one day and then left us all alone to deal with the Syrian regime attacks. They made fools of us. Clashes are also reported on the outskirts of Brital in eastern Lebanon between Syrian insurgents and Hezbollah fighters. The group Liwaa Ahrar al-Sunna said its members were involved. It claimed on Friday that it had captured three Hezbollah members near Baalbek. State news agency SANA reports a limited delivery of food aid to the beseiged Yarmouk neighborhood in Damascus on Friday. The head of a Palestinian refugee commission, Ali Mustafa, said that 550 food baskets were delivered with the co-operation of the United Nations refugee agency UNRWA. Mustafa said that four ill people were evacuated and admitted to hospitals in Damascus. He said the total exiting the camp is now 3,193, of whom 189 are students. Yarmouk has been besieged by the Syrian military since insurgents took control of much of the area last July. Of the pre-war population of 200,000, most of them Palestinians, only about 17,000 remain. It’s not enough. Demand for food is overwhelming. There are widespread reports of children with malnutrition, of people eating animal feed. It is beyond desperate. Aid agencies say the amount delivered since a February 22 UN Security Council resolution, demanding unrestricted access, has only been enough to feed the trapped population for about 10 days. The Local Coordination Committees claim 149 people killed across Syria on Friday, including 13 women and 19 children. Of the deaths, 88 were in Aleppo Province, 28 in Damascus and its suburbs, and 11 in Hama Province. The Violations Documentation Center have documented 94.994 deaths since the start of the conflict in March 2011. Of the dead, 69,031 were civilians.